This topic describes how to create volumes in Storage Spaces Direct using PowerShell or Failover Cluster Manager. If you haven't already, check out Planning volumes in Storage Spaces Direct first. We recommend using the New-Volume cmdlet to create volumes for Storage Spaces Direct. It provides the fastest and most straightforward experience. This single cmdlet automatically creates the virtual disk, partitions and formats it, creates the volume with matching name, and adds it to cluster shared volumes – all in one easy step. FriendlyName: Any string you want, for example "Volume1"
StoragePoolFriendlyName: The name of your storage pool, for example "S2D on ClusterName"
Size: The size of the volume, for example "10TB"
Windows, including PowerShell, counts using binary (base-2) numbers, whereas drives are often labeled using decimal (base-10) numbers. This explains why a "one terabyte" drive, defined as 1,000,000,000,000 bytes, appears in Windows as about "909 GB". This is expected. When creating volumes using New-Volume, you should specify the Size parameter in binary (base-2) numbers. For example, specifying "909GB" or "0.909495TB" will create a volume of approximately 1,000,000,000,000 bytes. To make things easier, if your deployment has only two servers, Storage Spaces Direct will automatically use two-way mirroring for resiliency. If your deployment has only three servers, it will automatically use three-way mirroring. If you have four or more servers, you can use the optional ResiliencySettingName parameter to choose your resiliency type. ResiliencySettingName: Either Mirror or Parity. In the following example, "Volume2" uses three-way mirroring and "Volume3" uses dual parity (often called "erasure coding"). In deployments with three types of drives, one volume can span the SSD and HDD tiers to reside partially on each. Likewise, in deployments with four or more servers, one volume can mix mirroring and dual parity to reside partially on each. To help you create such volumes, Storage Spaces Direct provides default tier templates called Performance and Capacity. They encapsulate definitions for three-way mirroring on the faster capacity drives (if applicable), and dual parity on the slower capacity drives (if applicable). You can see them by running the Get-StorageTier cmdlet. To create tiered volumes, reference these tier templates using the StorageTierFriendlyNames and StorageTierSizes parameters of the New-Volume cmdlet. For example, the following cmdlet creates one volume which mixes three-way mirroring and dual parity in 30:70 proportions. You can also create volumes using the New Virtual Disk Wizard (Storage Spaces Direct) followed by the New Volume Wizard from Failover Cluster Manager, although this workflow has many more manual steps and is not recommended. 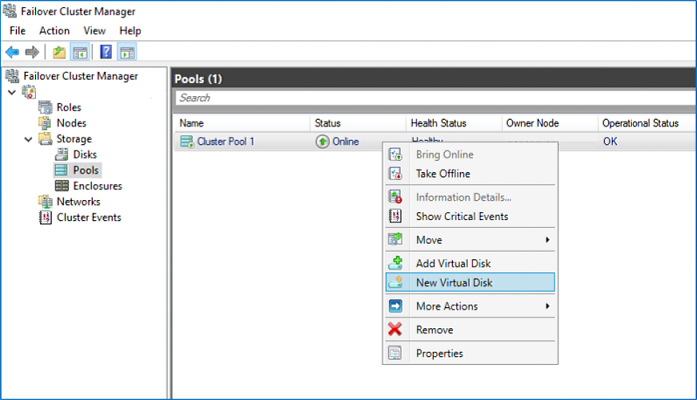 In Failover Cluster Manager, navigate to Storage -> Pools. Select New Virtual Disk from the Actions pane on the right, or right-click the pool and select New Virtual Disk. Select the storage pool and click OK. The New Virtual Disk Wizard (Storage Spaces Direct) will open. Use the wizard to name the virtual disk and specify its size. Review your selections and click Create. Be sure to check the box marked Create a volume when this wizard closes before closing. The New Volume Wizard will open. Select the virtual disk you just created and click Next. Specify the volume's size (default: the same size as the virtual disk) and click Next. Assign the volume to a drive letter or choose Don't assign to a drive letter and click Next. Specify the filesystem to use, leave the allocation unit size as Default, name the volume, and click Next. Review your selections and click Create, then Close. In Failover Cluster Manager, navigate to Storage -> Disks. 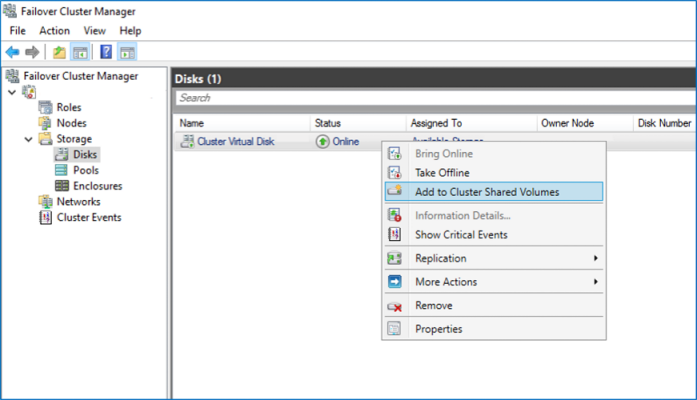 Select the virtual disk you just created and select Add to Cluster Shared Volumes from the Actions pane on the right, or right-click the virtual disk and select Add to Cluster Shared Volumes. You're done! Repeat as needed to create more than one volume.